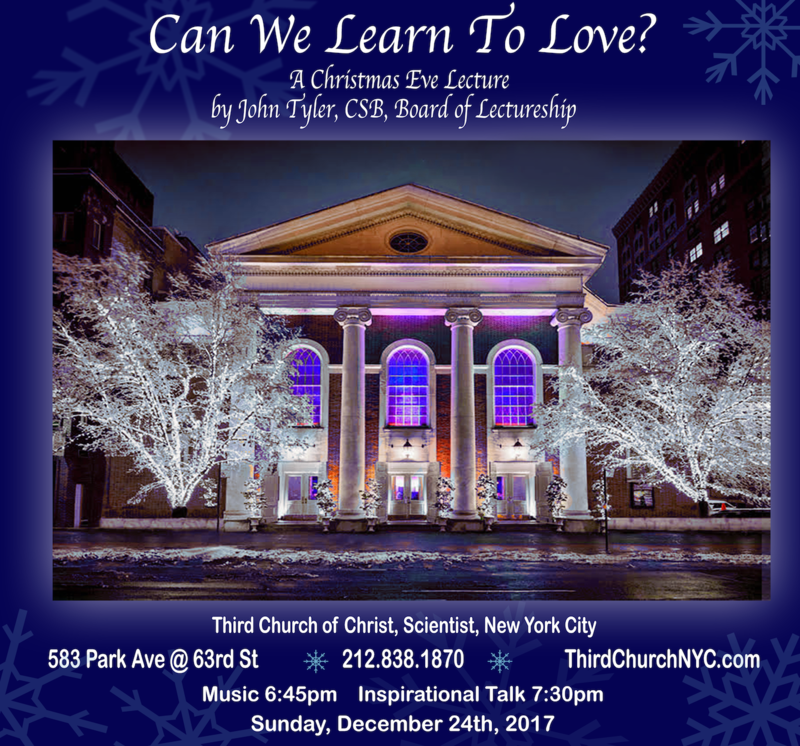 We invite you, our global family, to experience a special Christmas Eve talk by John Tyler, CSB, at Third Church of Christ, Scientist, in New York City. At the heart of the solution to every personal problem we have in our lives is the ability to love. Have you ever asked yourself what “real love” means? John will delve into the question of what love is and isn’t – and especially by learning how to love we can learn how to heal: how to heal every problem imaginable in our individual lives. It will be broadcast live in English and we will provide a live simultaneous Spanish translation for the Spanish-speaking audience. Holiday organ music begins at 6:45 pm, followed by musical performers at 7:00 pm. Mr. Tyler’s inspirational talk begins at 7:30 pm. We hope to spend this special time with you in person at 583 Park Avenue, where childcare will be provided for those too young to join in the festivities. Additionally, we invite those who cannot attend in person to watch online at ThirdChurchNYC.com or listen via conference phone call at (310) 372-7549, access code 607611. Meet our Speaker, John Tyler! John came across Christian Science as a teenager, and soon realized it’s not words but true loving and healing which attracts people to truth. In his full-time healing practice of over 30 years, he has seen God heal many supposedly incurable cases. He has worked as a labor organizer to protect exploited sweatshop workers, provided spiritual counseling of inmates in a state penitentiary, built institutions to solidify a just society, and founded a residence for students that seeks to heal racial divisions in America. Becca Shulbank-Smith has been singing in choirs her whole life. She studied voice with James Ruff at Vassar College, and performed several featured solos with the Vassar College Women’s Chorus. 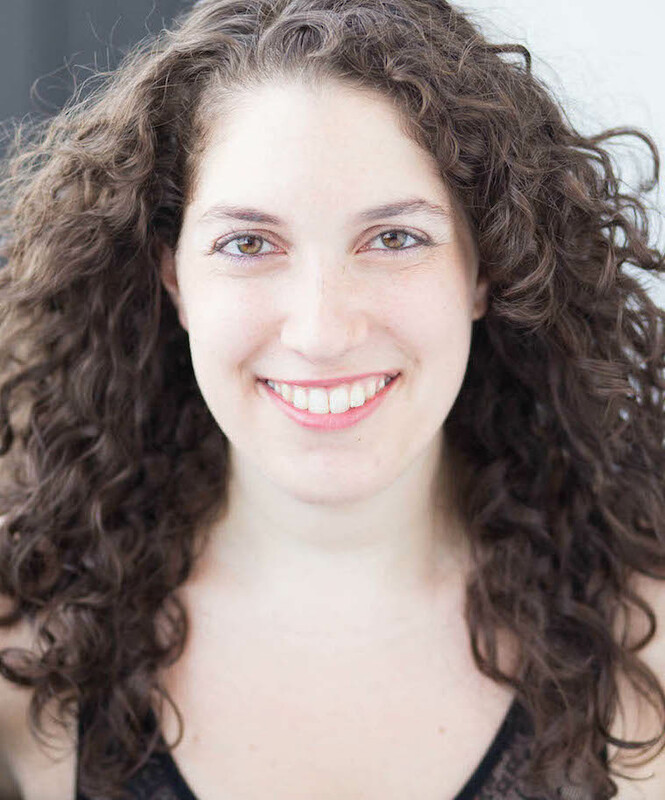 She was a soloist the House Choir for the The Events at New York Theatre Workshop, music directed by David Dabbon, and performed in the Mostly Mozart festival in 2016, as a section leader in “the public domain,” which performed at Lincoln Center. Scott Adam Kipnis was a member of the New York Choral Society (NYCS), and New York Choral Society Chamber Ensemble from 2014 through 2017, where he performed choral works by Beethoven, Handel, and many more. With the NYCS, he was also a part of the Christmas program each year, singing works by Shaw/Parker, Pachelbel, Gabrieli, Charles Ives, and many more. Scott was in the chorus of Apotheosis’ and performed, among others, the role of Jim Larkens as well as with the chorus in Puccini’s La Fanciulla del West. 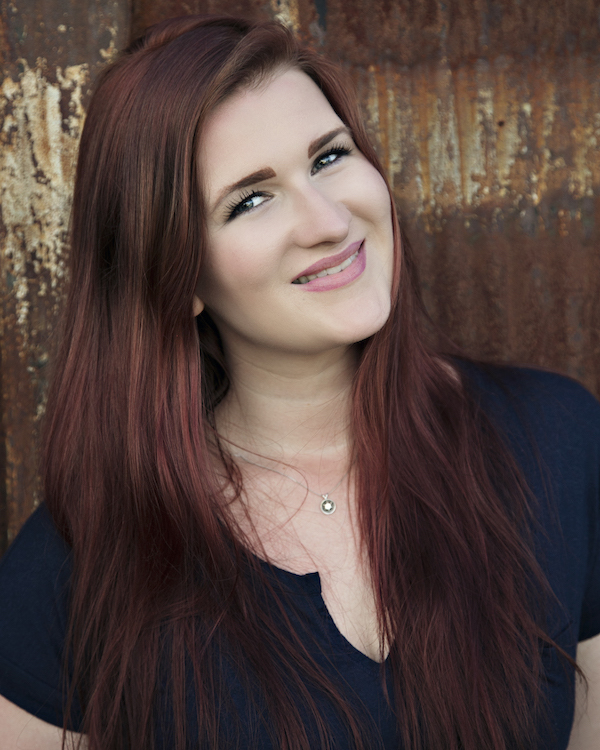 Sarah Godwin has also studied Opera Performance with Accademia dell’Arte in Arezzo, Italy and Musical Theater with the American Musical and Dramatic Academy in NYC. Sarah has performed and toured with several choirs including St. Mary’s Cathedral choir and can be heard on several volumes of “Christmas at St. Mary’s”. More recently, she has sung in the ensemble for “Question 1: The Musical”, and the “KEVIN!!!! !” Christmas choir. She has performed choral music at Cathedrals in D.C., England, London, and Italy, and Carnegie Hall. 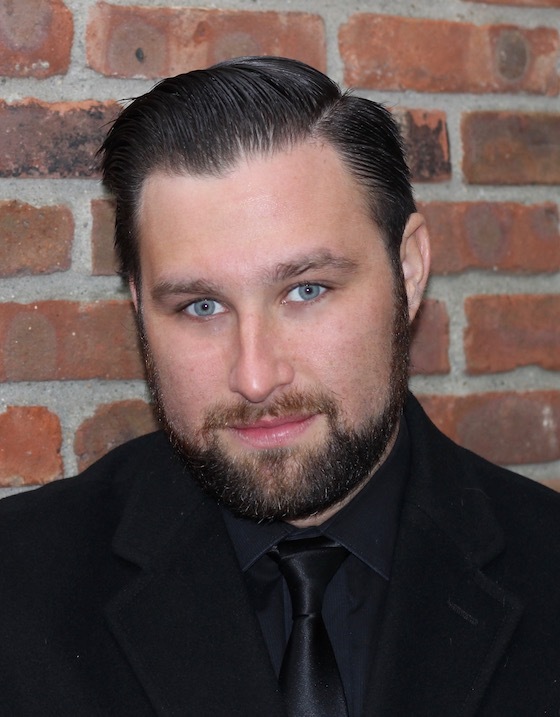 Richard Sears is a NYC based singer, vocal coach and music director. 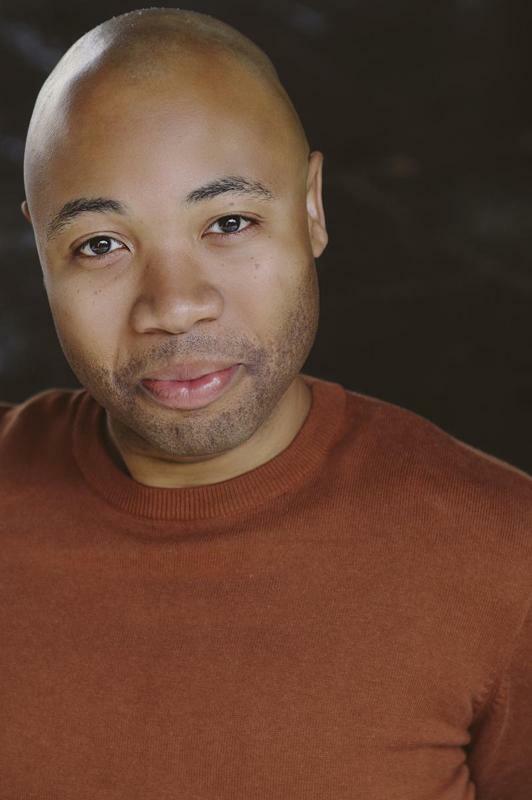 He has appeared in Don Giovanni (Amore Opera), Porgy and Bess (Evansville Philharmonic) and has been seen reinventing the role of Thomas in Walk This Way, an original rock opera (ICLV). As a choral singer, Richard was a part of the highly regarded African American Choral Ensemble of Southern Indiana, soloist and music director for the Crossroads Christian Church Choirs. He can be seen in ongoing performances of the “KEVIN!!!! !” Christmas choir. Third Church is committed to sharing this healing Christmas message to audiences worldwide. Please share this page with a friend so they can join us too. Donations for the evening’s festivities are gratefully accepted. Click here to donate today. We, as always, invite you to our Sunday services at 11:00am, our Wednesday meetings at 7:30pm to hear testimonies of healing, and our Sunday services in Spanish at 1:00pm. You are welcome to visit our Reading Room on the lower level of the Church building, to learn more about God’s love. You can also visit Spirituality.com to learn more about Christian Science, or this website ThirdChurchNYC.com to learn more about our church. As undiscribable gorgeous and very uplifting the Christmaslecture 2016 by Evan Mehlenbacher was, so was the Christmaslecture 2017 by John Tyler “can we learn to love”?. John showed us through many inspiring and interesting examples and healings through loving and forgiving in his lecture, that we c a n learn to love. I am so grateful for this so lively and very clear lecture – thank you! !